You don't have to spend the night at the DoubleTree to enjoy these chocolate cookies. Preheat oven to 375 degrees. Line baking sheets with parchment paper. Place the butter in a large bowl and cream lightly with an electric mixer. Add the sugars and beat on medium speed for about 2 minutes. Add the eggs, one at a time, beating well after each addition. Add the vanilla and lemon juice and mix well. In a separate bowl, stir together the flour, oatmeal, baking soda, salt and cinnamon. Add to the creamed butter mixture and stir well to blend. Add chocolate chips and walnuts and stir to combine. 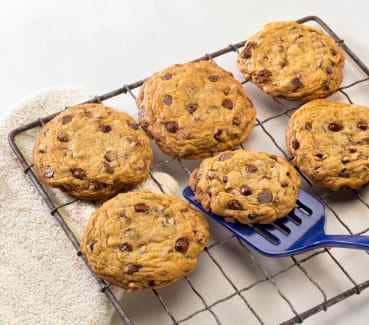 Using a 1/4 cup measure or a 2-oz ice cream scoop, drop the batter on the parchment-lined pans, leaving 2 -3 inches between each cookie. Should the oats be ground down in a food processor or used whole? Lycon, do you know how much walnut flour is added? You may want to add about 1/2 cup of walnut flour, I would reduce the amount of all purpose flour you would use. You guys are missing one key ingredient. Double Tree adds some walnut flour to their cookie recipe. You’ll never get the recipe spot on if you forget the walnut flour. Great tip, I appreciate it. I am so glad you enjoy these. Double Tree? Really!!?? No way…I have made this twice and I don’t think I will be making them a 3rd time. The 1st time I made them, they turned out flat and somewhat dry, like one of the comments made. And I did not microwave the butter – so that could not have a negative effect. I vowed never to try them again – but about 5 months after, I decided I will give them another shot. So last night, I made them and same results as before. I had some extra batter so I placed them in the freezer overnight and baked them this morning. They were not as flat but I find them a little dry and not as delicious as the Double Tree’s. I ended up trashing all the cookies. Not sure if I would waste anymore ingredients on these! I think freezing or refrigerating cookie dough for a long time does wonders for the dough in many ways. I like the recipe but how do they get them to be so perfect in shape and the sides thick? Refrigerate the dough first, and then use a small ice cream scoop to make even balls of dough before baking. Cool dough in refrigerator first to firm it up. I place dough on plastic wrap in a tube-like shape and wrap the dough completely. Roll with your hands so that it is appx. 2 to 2 1/2″ across in size. Place in freezer and whenever you you are ready to bake (one day or 6 months latert! ; really) remove the dough from the freezer, remove the plastic wrap and cut in appx. 1/4″ discs. Then lay on cooking sheet about 2″ apart. I make cookies, semi-commercially, in Brazil and have had to learn ways to package the dough to have inventory. My first concern was, “will freezing affect the taste, texture and quality?”… Absolutely not. In fact my wife found one dough I had made over a year earlier and I was apprehensive about using it, but decided why not. If I throw it away who will know if it was still good. The cookies smelled good while cooking and once they were done i offered to my wife’s son and one of his friends. After seeing them eat about 15 without getting sick I decided to try one and it was no different than a freshly made cookie. I think there is something to allowing the cookies to rest in the refrigerator/freezer. It seems to do something magical to the cookie dough. At least they taste good. I just finished making these cookies. The batter was a bit thin. After cooking them they were flat. Not sure why as all my ingredients were fresh??? They were ok. Good luck to all that try them! Sounds like you may have melted your butter. If the ingrediants get too warm or over mixed, they will turn out flat. Softened butter should be room temperature, not softened in the micro. Hope this helps. this is my all-time favorite cookie! i am thrilled to have the recipe. i can’t wait to whip up a batch. thanks for posting! before i even tried this recipe i knew it was the closest to the real deal because the chocolate chips were specified and the chocolate made the difference for me. i felt the bags of chocolate chips in the grocery store until i found the one that was the same size and shape of the ones in the cookies and it was the Ghirardelli that were a perfect match.